Today we have a guest post from a very special blogger: Jeremy Hawkins from BeingRetro.com. He's here to tell us one of many hilarious true stories from his "It's Time" book tour. After the story find out how to win an awesome prize! It’s September 1984 and I am heading to my first convention “Starlog Magazine” - brought to you by Creations Entertainment - and I didn’t know what to expect. First when you arrive you see nothing but a long line and over the years you get used to that. This line had people in costumes from Star Fleet Uniforms, to guys with Indiana Jones hats on with really long colorful scarves and me in my “Raising Hell” t-shirt. Waiting and waiting the line starts to move and you enter a room; someone takes your ticket, hand stamped and a glorious site of giveaways. Buttons, postcards and posters… Oh My. It was a beautiful buffet of things for me to take, oh and I did… several times. Grab a schedule and you are on your way as you shuffle into a room of “BUY ME” items, my eyes became so big.. must have everything. I am getting ahead of myself; I must tell you first I was driven down here by my father and my best friend Kevin was there. We weren’t old enough to drive and too young or stupid to take a train. We had the plan to meet my father every couple of hours and he would ask if we were ready to leave. My father was on an odd floor in the bar as we wandered the even floors of the convention. We knew nothing; we didn’t bother to look at the schedule except for “Star Trek’s Mr. Scott” James Doohan going on stage at a specific time and we wanted to be there. 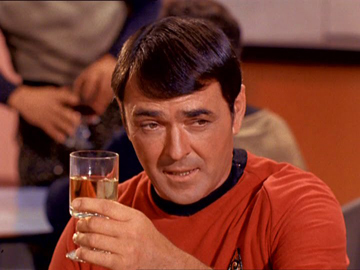 [Imagine Rocky Montage] Flash forward we are sitting off to the side because we want to be able to bail if this James Doohan thing is goes to be boring. Clapping, standing of the crowd and one man enters… holy crap that is Mr. Scott, not sure who I thought was going to be there… there he was in the flesh. My attention from how soon is this going to end to “totally locked into every word” he talked about history, his life and a couple moving stories that brought the crowd to tears. At this point the scheduled time he had seemed doubled, but who would tell him to stop? I thought I've got to have this man’s autograph and we headed out quickly as the man got the roar of the crowd to a subtle good-bye. We made it to where he was to sign and to my surprise there was a long… long line, this is a stinker. We left and figured we would return in a bit for the line to die down, so back to the free buttons room. 5 minutes pass we head back to the signing, line is short… there he is! Mr. Doohan greets and I step into the line with friend in tow. Closer and closer I make it to the man and some official guy walks up to the person before me and say’s “sorry kid. Line ends here” Mr. Doohan is on a tight schedule and is only allotted a certain amount of signatures. Wait WTF is the teenager's response, “there is no one behind us… I scream out, well if he doesn’t have time for his fans”… what I didn’t know they had a numbering system and everyone had a one except me… so it wasn’t anyone except my own fault. I got whooshed away from the line and told to behave. So not meeting a great man, it was time to meet up with my father for the third time… as we see him standing outside the elevator we tell him our story. My father’s response was "Really? 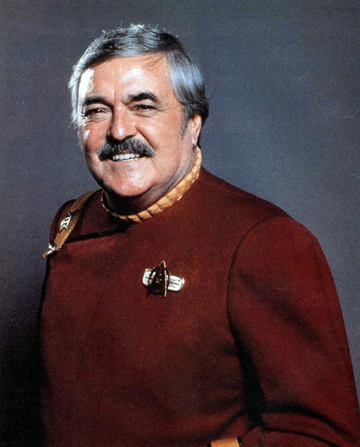 I just met James Doohan on the elevator going to meet you two…" Funny how that all works out. So sadly I would never get the chance to meet him, though I can tell you about the interview I had with George Takei and Nichelle Nichols. Though you will have to follow the tour in order to hear about that, so if that is not a teaser I don’t know what is. It's a four book series 40 pages each and it is the art/design from things I had designed over the years. It's a mish-mash of things that I had seen in my head... and some are future designs that will become shirts. Places I wanted to go artistically as you travel from where I was to where I am now. Is it great journey! Titles came from the idea of time "12:34, 35, 36 and 37” seems that is when my best ideas came to me... day or night. It's funny I never considered myself a "writer" just a man who likes to paint a canvas if it be words or my art/design. Giveaways: Some great prizes being given away please stop over at my main page “BEING RETRO” and look just below the header for the “It’s Time” Tour Giveaway link and enter today. Thank You, for letting me play host and to all who took the “time” to read this… you are all the best. What do you think of Jeremy's story? 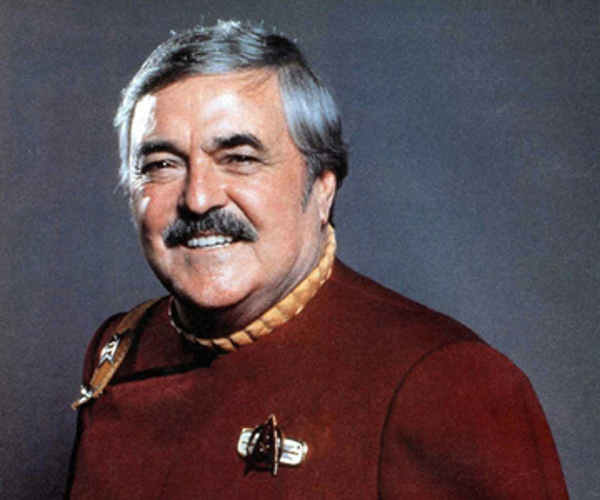 Would you have liked to meet James Doohan? Which Star Trek actor would you like to meet? So I guess the moral of the story is just to hang around the elevators at conventions. Another great story. I always hate looking back at times in my youth and going DOH!! If only we had a time machine we could go back and slap our younger selves! See you at the next tour stop. totally, toys for one thing... having all the mego figures and marvel stickers from the 70's. we jumped to a horror convention... not you think trek cons are odd? that will be another story i guess. Trek Cons are cool. Just some of the attendees are a little odd. Like the ones that voted Into Darkness as the worst Trek film ever. I still have my some Kenner Star Wars toys. My son likes to play with my AT-AT when he visits grandma. Was this show in Chicago - and was Tom Savini there on the Fangoria side of things? All i remember is it being the Congress Hotel, I only remember bits of it... Were you there? Oh I just remembered I interviewed Dean Haglund too... in this grand ball room in the city of Chicago... that was an amazing adventure. Maybe that could be a story to share too.... I think that was the only x-files one I went to. Poll: Which OLDER Actor Would You Cast as Batman? Would You Rather: Have Proof of UFOs or Fairies?